Sometimes you want a dessert, but don't want to commit to an entire slice of pie or cake. What about a cookie? Cookies, although very good, really aren't thought of as a dessert, and you had in mind something cake- or pie-like. That's when a tiny treat comes in handy. All the crust ingredients are beaten together until creamy. This took 2 tablespoons of water. 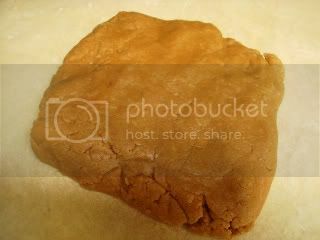 After it was mostly combined, I placed it on a piece of wax paper and used the edges to "knead" it a bit more until a solid piece of dough formed. From that square, cut it in half, then each half in half. Roll each section out and slice it in half, then each half in thirds. 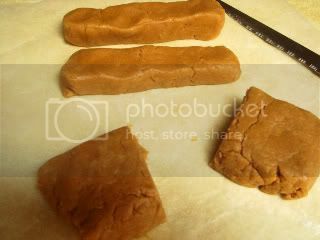 If one piece doesn't seem large enough and another seems too large, pinch a bit of dough off of the large piece. Tamping the pieces into two mini muffin tins takes a bit of time. Be patient, don't rush it, and don't be alarmed if there are minuscule holes in the crust because it'll work itself out. I used the handle of a large wooden spoon to help tamp the dough in, then I worked the edges with my fingertips. 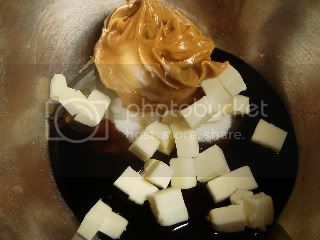 The fudgy goo is cooked a bit on the stove to blend the ingredients. 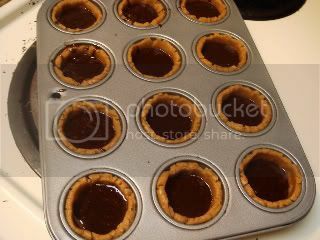 Fill each cup halfway first, then divide the rest of the chocolate mixture between the cups. When it's baked the filling will have puffed considerably. (Don't touch the filling or else it'll stick to your fingers.) The majority of the tops should have lost the look of raw. After cooling the middles may sink a bit. Dress it up by sprinkling it lightly with confectioner's sugar. 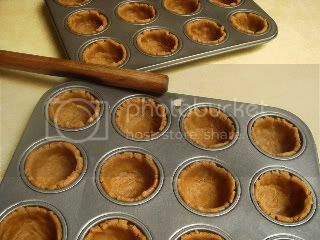 To prepare crust, place first 4 ingredients in a large bowl; beat with a mixer at medium speed until smooth. Lightly spoon 1 cup flour into a dry measuring cup; level with a knife. 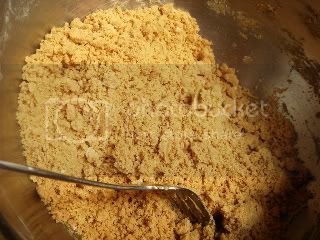 Add flour and salt to peanut butter mixture; cut in flour with a pastry blender or 2 knives (I used a fork) until mixture resembles coarse meal. Sprinkle surface with cold water, 1 tablespoon at a time (you may not need all the water); toss with a fork until combined. Shape mixture into 24 balls. Place 1 ball in each of 24 miniature muffin cups coated with cooking spray (I think my tins are nonstick, so I didn't need to spray them). Press dough into bottoms and up sides of muffin cups. 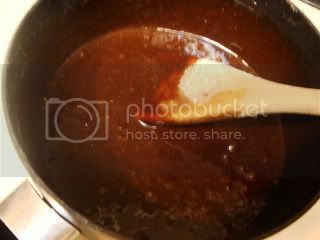 To prepare filling, combine ⅔ cup brown sugar and the next 4 ingredients (⅔ cup brown sugar through milk) in a small saucepan over medium-low heat. Cook 3 to 4 minutes or until smooth, stirring frequently. Remove from heat; stir in 2 tablespoons flour and egg until well blended. 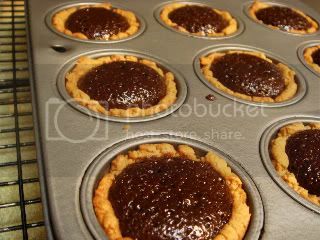 Divide chocolate mixture evenly among muffin cups. 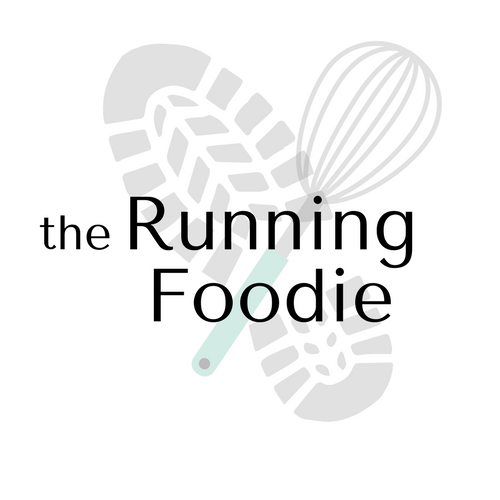 Bake at 350° for 10-13 minutes or until the pastry is lightly browned; cool in pan on a wire rack 5 minutes. Run a knife around outside edges of cups. Remove cups from pan; cool completely on wire rack. 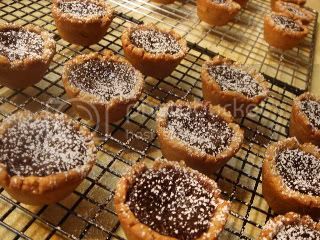 Sprinkle with confectioner's sugar. So precious--and they sound so decadent! 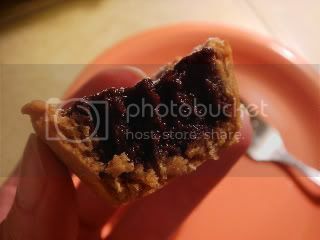 I love a rich filling like this against a gorgeously, lightly salty crust. Yum! Wow! this looks better than a Reese's peanut butter cup! And, since those are my favorite, that is a huge accomplishment. I love "little tastes". I think that is the best way to eat dessert. Those are seriously the cutest little cups. I would love to make them sometime. Gosh Christina that is an excellent presentation and a beautiful little bite of dessert!! 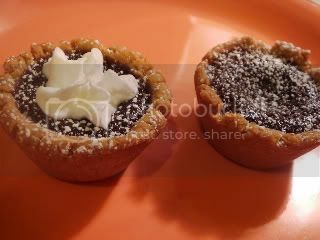 i am deff going to make those soon. time for a trip to the store. That looks SO good. That's a great idea, but you know what I'd do? You can never eat just one. ;-) By the way, what's poweryoga?